Geolocation is the process of calculating a signal’s position on the surface of the earth. This process can be performed by computing the Direction of Arrival (DoA) from two or more independent, known locations, and observing where these directions cross. This “triangulation” can be done from multiple stationary platforms or by performing multiple DoAs from a moving platform. On Target Enterprises extends the direction of arrival research to geolocation methods, using classical and hybrid Direction Finding (DF) methods. Many of the applications for this research are of a military nature, typically for situational awareness, crisis area monitoring, and early detection of potential problems. Emerging commercial applications include identification and geolocation of signals that interfere with communication systems. This allows economic and political opportunities to be explored where technical efforts may be cost-prohibitive. 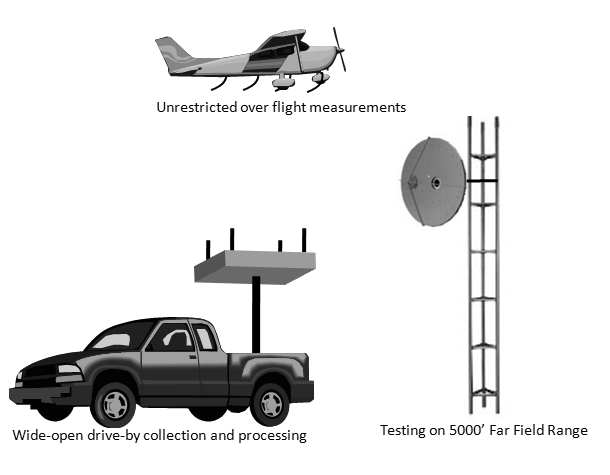 On Target Enterprises has a distinguished history of developing and demonstrating concepts for Direction Finding (DF) techniques in the HF, UHF, VHF, and Microwave frequency ranges. Various techniques are utilized including phase interferometry, amplitude monopulse, complex dual-polarized monopulse, and specialized wideband time/frequency difference techniques. Techniques utilized in On Target Enterprises DF capable surveillance system products. Many of the challenging aspects of these methods have been solved using innovative processes for hardware fabrication: antenna development, beamformer construction, and receiver design. Specialized processing software has been crafted to adapt high-speed unambiguous solutions within compact, affordable computer platforms. Algorithms specific to solving two and three-dimensional location estimation from multiple DF solutions have been optimized for confidence and reliability. Calibration schemes have been devised, which seek the best compromise between system accuracy, component stability, and cost efficiency. Error budgets are developed which quickly reveal the cost/benefit pivot points in a given system. Computer modeling is an important and highly developed aspect of On Target Enterprises capabilities suite. The simplest models offer interactive error budgets using straightforward independent-error stochastic methods to estimate system performance. More sophisticated models incorporate statistical modeling of the more critical and statistically interdependent error sources. The highest fidelity models include electromagnetic simulations of collection antenna configurations and emitter characteristics that impact DF and geometric location estimation. On Target’s strongest capability is that of rapid demonstration of these concepts. Hardware can be instantly assembled for static range testing on our 2000 foot far-field facility employing any combination of DF methods. This enables the proof-of-concept of virtually any DF system imaginable. An on-site prototype shop incorporates mechanical design, welding, machining, and woodwork. RF antenna and component fabrication is performed within meters of the mechanical shop. Modifications to system concepts can be implemented almost as fast as they can be envisioned. Furthermore, On Target Enterprises rural environment is perfectly suited for vehicular installation and testing. Gently rolling plains with almost no trees, few power lines, and total absence of airspace restrictions favor low-cost aircraft demonstrations.